Green spears of goodness are hard to improve on, but this rich buttery sauce might do the trick. To make hollandaise, you will need a bowl that sits comfortably over a saucepan of gently simmering water. Put egg yolks, some sea salt and 1 tbsp water in the bowl and gently hand-whisk. Put the bowl over water and continue whisking. Take care that the base of the bowl doesn't touch the water. As it approaches the point at which it is fully cooked, the mixture will thicken, doubling or tripling in size. It is very important for the egg yolks to reach this point, otherwise the sauce will fall apart when you add the butter. When sauce is thick, add 3-4 cubes of butter, whisking until fully incorporated before adding the next lot. Repeat until butter is all used. Don't rush this stage. The sauce will split if you add too much butter at one time. Also, make sure the sauce doesn't get too hot. You can lift the bowl off the pan from time to time. When butter is fully incorporated, remove bowl from the heat, squeeze in juice of 1/2 lemon and add lots of ground pepper. Whisk to incorporate. Taste for salt and lemon, add more if desired. To cook asparagus, bring a large pot of salted water to the boil. Snap bottoms off asparagus, place gently in pot and boil for 1-2 minutes until al dente. Drain and dry asparagus with paper towel. 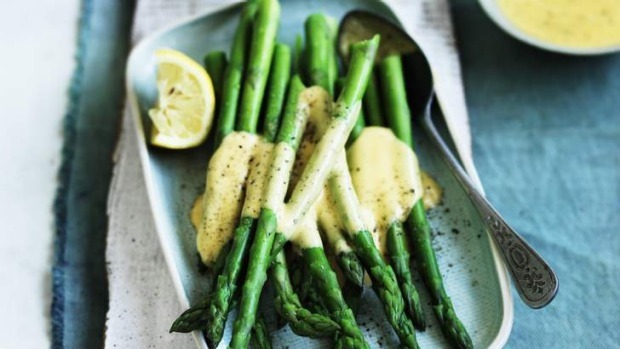 To serve, divide asparagus between four plates, pour hollandaise over the top and finish with a good grind of pepper.